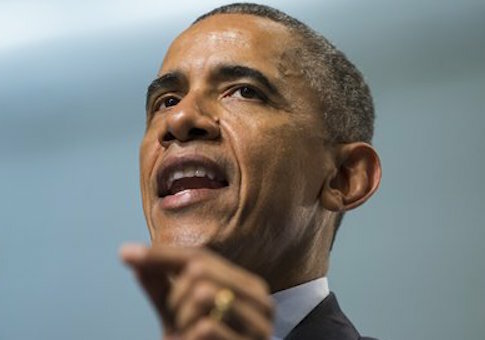 President Obama has ordered the U.S. government to admit no fewer than 10,000 Syrian refugees in the next fiscal year. The Washington Post reported White House press secretary Josh Earnest announced the figure Thursday, labeling it an "ambitious goal." The number is six times the amount of Syrian refugees that the United States has allowed into the country since the civil war began in Syria. The announcement comes a day after Director of National Intelligence James Clapper expressed "huge concern" that Islamic State terrorists might infiltrate the crowds of thousands of Syrian refugees flocking to Europe and the United States to escape the ongoing conflict in the Middle East. According to the State Department, nearly 1,600 Syrian refugees have already been permitted to enter the U.S. since the start of the Syrian civil war during which President Bashar al-Assad has launched chemical weapons attacks on civilians. The refugees become permanent residents of the U.S. and are allowed to work in the country. They gain green card eligibility after a year and can become U.S. citizens after five. According to Kevin Appleby, director of migration policy for the U.S. Conference of Catholic Bishops who is helping settle some of the refugees, "The idea of the program is to stay. They could return, but most of them will stay. Then they’ll try to petition for families to join them if they can." While each Syrian refugee is investigated before being admitted to the country as a refugee, a process that typically takes up to two years, Clapper nevertheless voiced worry Wednesday that IS (also known as ISIL or ISIS) terrorists could disguise themselves among the approximately 4.1 million refugees fleeing from Syria. "As they descend on Europe, one of the obvious issues that we worry about, and in turn as we bring refugees into this country, is exactly what’s their background?" Clapper said during at a U.S. intelligence community conference in Washington, D.C.
"We don’t obviously put it past the likes of ISIL to infiltrate operatives among these refugees." On Thursday, Earnest insisted that the plan to accept more refugees next year doesn’t "reflect the intent by the administration to cut any corners when it comes to the security protocols that are in place." He also encouraged European countries and other nations in the Middle East to "ramp up" their willingness to accept more Syrian refugees. Still, White House officials insist that they do not plan to send more troops to the Middle East to combat the crisis. Meanwhile, Russia, a major Assad ally, appears to be constructing a military base in Syria that could hold up to 1,000 troops. This entry was posted in National Security and tagged Barack Obama, Bashar al-Assad, Syria. Bookmark the permalink.